Dr Simon Eccles is the Chief Clinical Information Officer for Health and Care. The role spans the Department of Health and Social Care, NHS England, NHS Improvement and the arms-length bodies. He is accountable for delivery of the Personal Health and Care 2020 programme, and the whole of the central NHS IT expenditure. Simon still practices one day a week as a consultant in Emergency Medicine at St Thomas’ Hospital. Former roles have included: Programme Director for Emergency Care Pathways transformation at Guys and St Thomas’, including overseeing the building of a new Emergency Floor on the St Thomas’ site; joint Clinical Director for Urgent and Emergency Care for NHSE London; joint SRO for Urgent and Emergency Care in South East London and a reviewer with CQC, the MPA and NHS England. He has been SRO for Interoperability within the P2020 programme and for NHSmail, providing secure communication across the NHS. Simon was a first wave graduate of the Major Projects Leadership Academy at the Said Business School, Oxford sponsored by the Cabinet Office. 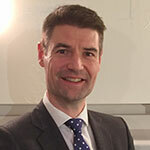 He was previously the Medical Director for NHS Connecting for Health, where he had responsibility for clinical engagement in health informatics as a driver for clinical quality and productivity improvement. He was the clinical lead for the NHS Information Strategy in 2011. Simon Eccles qualified from the London Hospital Medical College in 1994. He has previously chaired the BMA Junior Doctors Committee; leading in addressing the challenges of changing doctors’ post-graduate training and the European Working Time Directive. He has held a number of strategy and policy advisory roles within the Department of Health, including clinical lead for the Hospital at Night programme. Simon Eccles is co-author of the Oxford Handbook of the Foundation Programme and joint editor of the best selling careers guide ‘So you want to be a brain surgeon’.